You have a business. You have a website. But can your clients actually find you online? If they Google your business or services, what do they find? A study by research firm Clutch has uncovered that 46% of small businesses do not have a website, citing costs and relevancy as the top 2 reasons why. In this digital age, not having a web presence can be hurting your business, so let's take a deeper look at how a lack of online presence can affect you. Promoting your business today is all about being visible online. Yes there are a number of offline things you should do also - like networking, trade shows, conferences, and traditional advertising but let's face it, when you meet a potential client the first thing they do when they get a chance is Google you and your business to see if you're legit. What will they find? This is where SEO, or Search Engine Optimization, comes into play. A professionally-designed website is built with SEO best practices in mind and can directly contribute to your sales growth. "I landed a contract that paid for my website 3 times over and will provide me with enough work for 12 months", said Christine Mann of Business Stepping Stones. She added that her client had stated "We saw your website and knew you were professional". Wouldn't you like that to be your business success story? Find out which keywords prospects are searching for when they look for your products or services, and make sure they feature prominently in your page titles, copy (text), image descriptions and links. Use Google Keyword Planner to get you started if you're not sure. These behind-the-scenes SEO features will go a long way in getting you noticed by search engines. 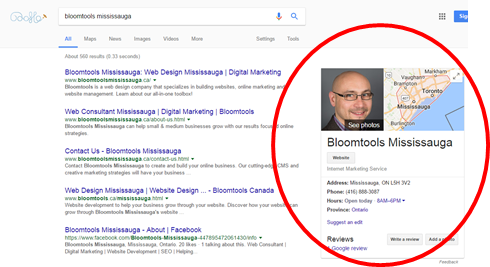 Images can have keywords too; make sure your images are named for your product or service to increase their search engine potency. Nothing says "I don't care" like content that is stale and outdated. Get rid of that 2012 catalog! Remove irrelevant information and check your links. A blog is a perfect way to keep content fresh, to show off your expertise and value, and can be keyword rich to help your overall SEO ranking. First of all it's free! A Google My Business Account is also easy to set up. And it's Google so it's good for your SEO too. Promote your business by grabbing prime real estate on the search results page. You can't get much more visible than that! Did we mention it's free? If you'd love to do more with your Website's SEO to increase leads, get more sales, or gain more online traction but still aren't exactly sure how to go about it, then please contact us and let our SEO experts help you grow your business! About: With extensive Marketing and Business Development experience acquired in the hi-tech industry, Benoît is a web consultant with Bloomtools helping small and medium companies grow their business online.